Once in the laser suite, Dr. Parker will get you situated on the surgical bed and give you a ball to squeeze during surgery. 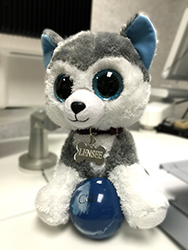 If you need re-inforcements, Lensee, our Laser Room Mascot, is there to lend you a paw and comfort you during your LASIK eye surgery procedure. If the laser team lets Dr. Parker choose the music, you might hear anything from John Denver, to Kenny Chesney to Abba’s Dancing Queen. The bed will be positioned under the IntraLase laser first. This is the laser that uses gas bubbles to gently separate the corneal tissue preparing the eye for treatment by the excimer laser. Dr. Parker will begin by taping a shield over your left eye and instilling numbing drops in your right eye. Next, he will use a lid separator to keep your right eye open and ask you focus on a flashing light. The lights will be off during this step. You will feel some pressure and you’re vision will dim for about 30 seconds while the the flap on your cornea is created. These are both good signs that the laser is secure on your eye. These steps will be repeated to create the corneal flap on your left eye. After the flap is created on both eyes, the surgical bed will pivot to the excimer laser for the final step of your LASIK eye surgery procedure. 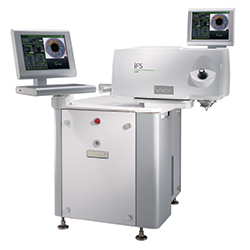 This is the laser that reshapes your cornea according to the CustomVue WaveScan data from your pre-operative exam. Your WaveScan information is programmed onto a laser treatment card which is a “credit card” inserted into the laser providing the exact mapping to correct your vision. We ask you do not wear jewelry, namely earrings, or hair bands because the pillow under your head will inflate to help position you under the excimer laser. Dr. Parker will prepare your right eye for treatment while Gerald runs a self test on the laser. When the excimer laser reshapes your cornea, it uses a cool beam to apply small, rapid bursts of laser energy to remove microscopic amounts of tissue. You will hear a ticking sound when the laser is activated. Dr. Parker will lift the flap created by the IntraLase laser which will cause your vision to become fuzzy. The lights will dim and Gerald will activate the laser and countdown until treatment is complete. Depending on your prescription, the laser typically runs less than a minute. Many patients are concerned about moving their eye during surgery affecting the treatment. 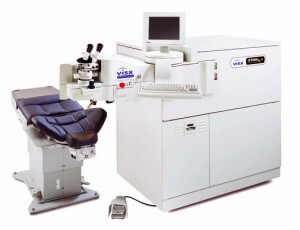 The excimer laser uses “Iris Registration” which works kind of like a missile lock on the unique points of your iris (the colored part of your eye). This allows the laser to follow any tiny movements of your eye and automatically reposition itself to ensure accuracy. Once your laser treatment is complete, Dr. Parker will replace the flap and smooth it back into place with a special surgical sponge. He will use antibiotic, steroid, and anti-inflammatory drops and instill an additional numbing drop. The same steps will be taken to treat your left eye. Most patients notice results immediately. You will have a lot of drops and water in your eyes causing some blurriness but vision will continue to improve over the next 24 hours. Your eyes will be teary, burning, and blurry directly after the procedure. 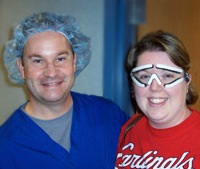 Dr. Parker and Lori will place clear shields over your eyes which fit securely with an elastic strap. These shields will stay on until you wake up the next morning.